I’m calling this my solo lady brunch. The other day Mike had a early tee-time so he was out and about really early while I was still lazying about and reading in bed. When I finally got up, I had a little brunch craving. I thought about going out, but I’m actually super weird about eating alone while I’m out so I’ve never gone out for brunch by myself. There’s something about all those other groups of happy people brunching that makes me cringe and want to have a mimosa in peace at home. So I decided to have a lil’ single lady brunch action, pyjama-style. This is essentially toast and eggs, but just a bit more fancy. 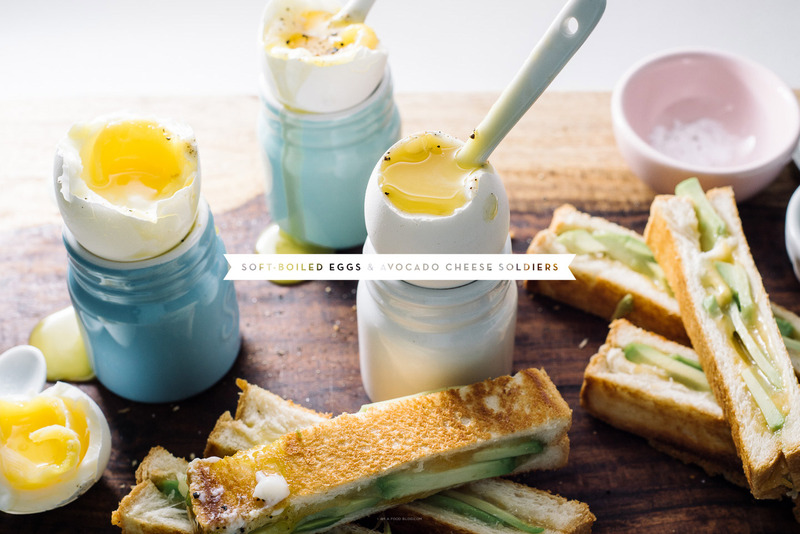 Six-minute soft boiled eggs with avocado grilled cheese dippers and lots and lots of fresh pepper. I made myself a big pot of pour over coffee and continued reading (Big Little Lies, if you’re interested), getting egg yolk everywhere and thinking about whether or not I should have a second grilled cheese. As much as I don’t like eating out by myself, there’s something about having brunch all by yourself at home that seems really, really luxurious. Hope everyone’s having a luxurious Sunday! Set up for boiling the eggs by preparing a large bowl of cold water and ice. Set aside for when the eggs are done. Bring a pot of water with 3 inches of water up to to a boil over high heat. While your water is coming to a boil, heat up a skillet or frying pan on medium-low heat and assemble your sandwich. Butter the outsides of the bread and lay down on a cutting board, butter facing down. Evenly layer on half of the shredded cheese on one slice. Top with the sliced avocado and the remaining cheese. Top with the other slice of bread, butter side out. By now your water should be boiling – reduce the heat until the water is barely simmering. Using a slotted spoon, gently add your eggs and set a timer for 6 minutes. Cook your sandwich slowly on medium-low heat until golden brown and toasty, flipping once. When perfect, remove from the pan and slice into soldiers. You should be just about down cooking your sandwich when the 6 minutes are up. Use the slotted spoon to remove the eggs and immediately plunge into the ice water bath. 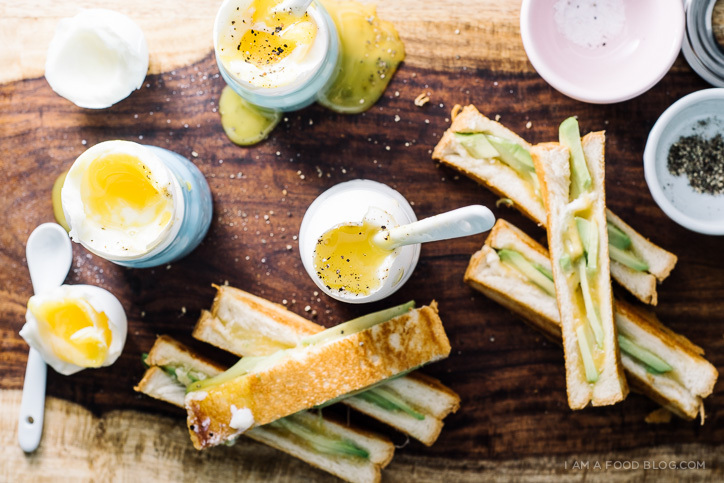 Put the eggs into egg cups, lop the tops off, sprinkle with salt and pepper and enjoy immediately with the avocado grilled cheese soldiers. 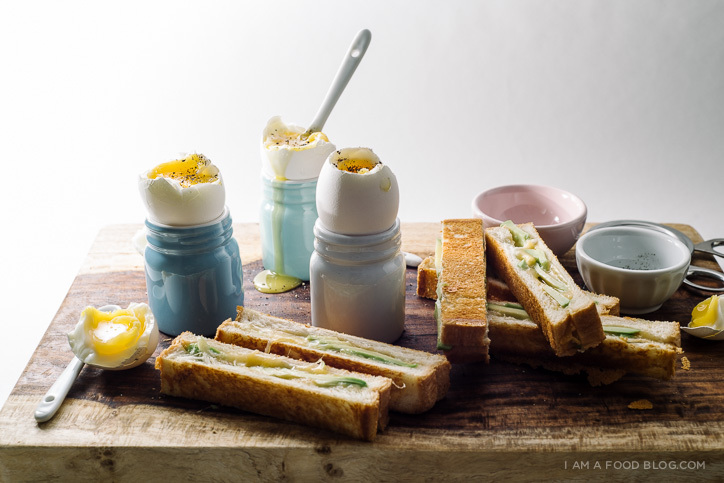 PS – Don’t you love my egg cups? They’re from Front and Company! PPS – I was inspired by these bad boys! I absolutely DO love your egg cups! And that avocado filled soldier! Yum! Why have I NEVER thought to make avocado soldiers?! 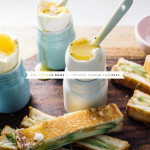 I can’t wait for next weekend to try this, I just need some little egg cups now! Love those little egg cups. And this sounds like just the kind of brunch I could go for right about now. Avocados, cheese and runny egg? You’re speaking my language! Oh so perfect! And those egg cups, I’m obsessed! Avocado in grilled cheese!! Why didn’t I think of that? It looks delicious! 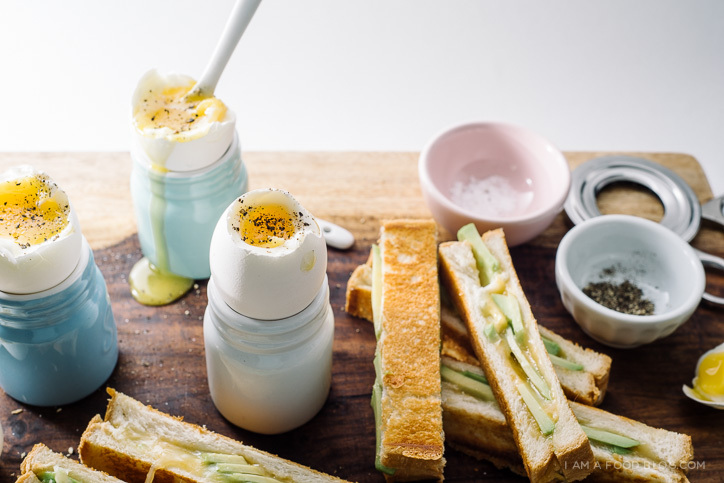 And those egg cups are swoon-worthy! I love the form of the grilled cheese… it classes the sandwich up and makes it more brunchy! Love the lil summin’ added to the grilled cheese – avocado sounds like an amazing addition! ooh these are so cute!! I, too, love a little single lady lunch when my husband isn’t around. It’s so quiet and relaxing (and I get to watch Real Housewives without any eye rolls). Those are officially the cutest egg cups I’ve ever seen. Major jar obsession over here. Simple and delicious – Love it! Why are you trying to make me fat? It isn’t nice! Your pictures make me drool I’m such a huge fan of your blog…kisses from France! I’ve just made it and turn up fabulous!!! Thanxs!! !